Well, at a 14.8% house edge, I’ll probably look for a better paytable before I play this bet. Has anyone seen any other paytables out there? In Ultimate Texas Hold’Em (UTH), I wondered if it was ever worth checking bottom pair on the flop (basic strategy says to 2x bet), given other player hand info. E.g., if none of the other 5 players paired the board, should you check bottom pair? I ran simulations to compare the value of 2x betting bottom pair, vs. checking on a 6 player table. This shows that even if no one else hits middle or top pair on the board (i.e., players are holding 10 cards that don’t hit middle or top board cards), it’s still worth 10% of the Ante to 2x bet bottom pair on the flop, compared to checking. It was useful to see these results, because it shows the value of the other players hitting the board, as expected. I wasn’t sure about betting bottom pair when everyone else missed, but the simulations show its still a good bet. I finally got around to simulating the effects of player collusion in Ultimate Texas Hold’Em. Implementing preflop collusion, and the improved 2nd nut kicker and 3rd nut kicker strategies, the house edge is reduced from 2.2% to 1.6% for 6 players. While this is a small average gain, the real benefit comes from the reduced variance gained by not raising marginal hands when copied with other players. By checking marginal copied hands, the session outcome distribution improves as shown below. Assuming a bankroll of 200 Antes, a goal of 20 Antes, and a maximum session length of 250 hands, the improved strategy reduces the probability of busting out from .20% down to .13%. The probability of reaching your 20 Ante win is reduced from 69% to 68%, but the distribution for the in-between cases improves as shown. 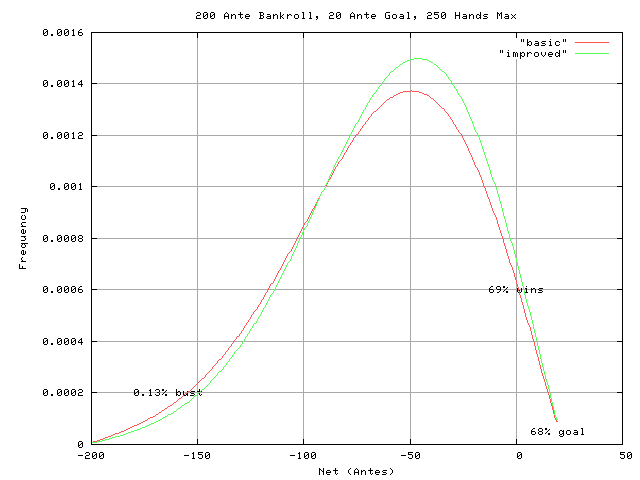 Session outcome probabilities for 200 Ante bankroll, 20 Ante goal, 250 max hands. Session outcome distributions with and without the Trips bet. Yep, more variance, more cost, and more fun. Finally, you can now play Ultimate Texas Hold’Em online with my new practice game. 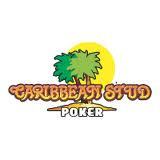 The main purpose of this game is to allow people to practice different betting strategies, and to learn for free. Learning UTH in the casino can be very costly, since most people don’t bet their hands like they should. I put in basic strategy hints in the game which gently suggests when to bet. 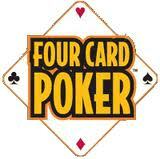 A lot of times when playing Ultimate Texas Hold’em, you’ll be faced with a 1x river call with a bare minimum kicker. It probably occurs to you that the strength of your call depends on how much of the board the other players have hit. For example, say you’re looking at 1x calling an unpaired board with 2nd nut kicker. Basic strategy says to call if it’s not a scare board, nor gutshot board, and there’s no possible flush on board, or if both your kickers play. (This situation occurs 1.3% of the time if you play basic strategy, and more frequently if you play less aggressively than basic strategy.) Your odds are better if the players at the table connected with the board (made a lot of pairs) than if everyone missed. I ran some simulations to quantify this effect, to show how you can use table information to improve this call. So, for example, say you have Jh 2s and the board is Ah Ks Th 9d 3s. With no more information, the odds are that you should call (+19.1%). However, if you’re at a full table (6 players), and all the other players only made 2 pairs with the board, then you should fold. The percentages of the table don’t exactly apply to this specific case, but are averages over 20 million hands, and all cases where basic strategy said to call with 2nd nut kicker.